As the cold weather slowly (or maybe not so slowly) starts to fall (see what I did there ;-)) upon us, there are some obvious trends sprouting. I will caution that trends are just that. They may stick around for a season, a couple of seasons, or in the case of skinny jeans, indefinitely! If you're interested in trying some of the recent trends I'm about to show I would definitely say choose what suits your style. Just because it's a trend doesn't mean it's flattering on your body type or should be a part of your wardrobe. I don't always get on board with each trend based on my personal style opinions but I like to give some of them a try. There are so many shades of red that fall into this category but I personally love poppy red. It's very vibrant and goes great with an olive skin tone. If you're fair skinned I would suggest going with a little bit darker hue of red. Something more along the lines burgundy or maroon. If this trend scares you a little bit you can use red as an accent color. A cute pair of red statement flats, bag or scarf can set a classic outfit apart as well. If you're so bold, give a red lip a try! This trend is an easy one to get on board with! Chenille is an extremely soft fabric. It feels a little bit like velvet, but is thicker and more luxurious. I have already added a couple chenille sweaters to my wardrobe and love them. I definitely won't complain about a trend that includes wearing fabric that feels like a blanket! 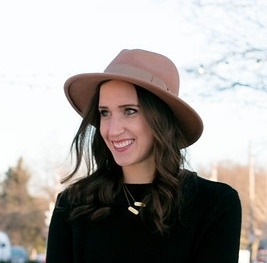 So maybe hats have been in style for a long time but the season hat trend is definitely something beyond a wool floppy hat - although that look is still a winner in my book. The two hat trends that have emerged are the baker boy hat and the Parisian inspired beret. I have yet to try either of these trends but I've got a few options on the way so you'll definitely be seeing it on the blog soon! This is a trend that I personally love! There are a couple reasons for it but mostly because the style is extremely comfortable! Menswear can be a little over-sized and if you're taller that works. If you are on the shorter side you can still wear the trend but you'll want to wear styles that are more tailored so your frame is not overwhelmed. I've included both types of styles below so you can see what I mean. I think this might be one of my favorite trends but definitely in moderation. Unless it's a jumpsuit, you're not going to see me in head to toe velvet. And honestly, my opinion is that it's not for everyday wear. I would wear it on date night or to parties or holiday events but running errands is not the time to whip out velvet. The fabric itself can be tricky in that if you're not careful it can look cheap. So if you're interested in trying this trend I would suggest going with a good quality fabric or starting with pieces that are accented with velvet. I will admit that I just snagged some velvet pants (below) that I'm excited to try!! Sock boots are a trend that I absolutely love! I mean what's not to love about a boot that is slimming and extends the length of your legs to look like that of a supermodel! They are designed to fit, as you would guess, like a sock. The fabric is tight around your foot and ankle and typically stretchy for easy on/off and I mostly see them with a block heel. I've had to show some restraint lately because there are so many options that I absolutely love in different colors and fabrics. To start, I purchased a tan pair and I'll be showing you how I style them next week.